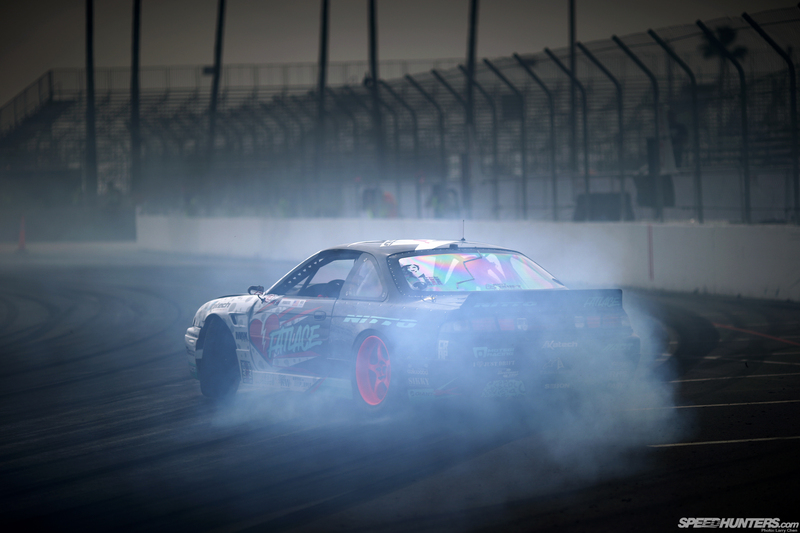 There is no doubt that this year we’ll be looking back quite often at what professional drifting has become in North America. 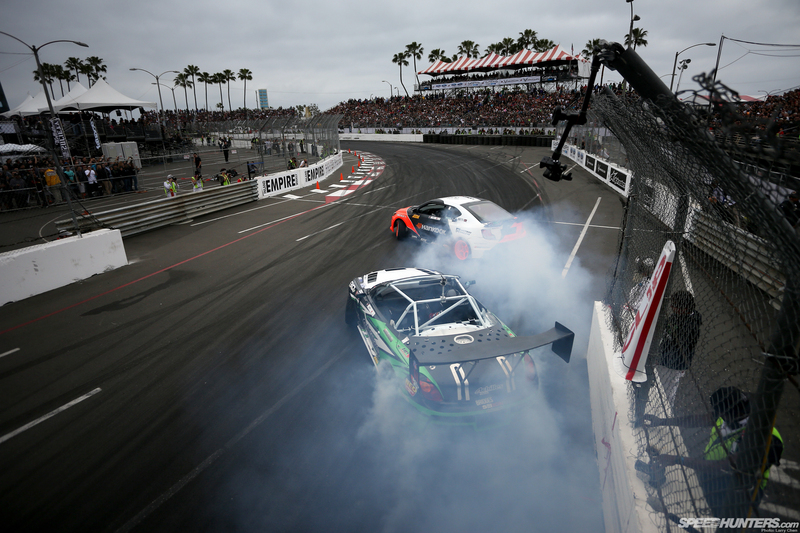 This was the eighth running of Formula Drift Long Beach and I am very proud to say that I have been on the front lines for each and every one of them. 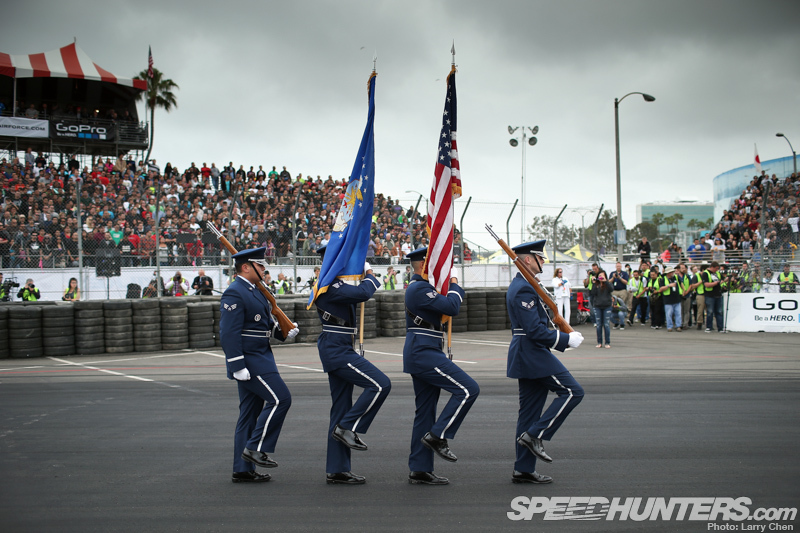 I’ve watched the sport grow from humble beginnings to a fully fledged major motorsport. I’ve seen Daijiro Yoshihara grow as a driver by leaps and bounds. 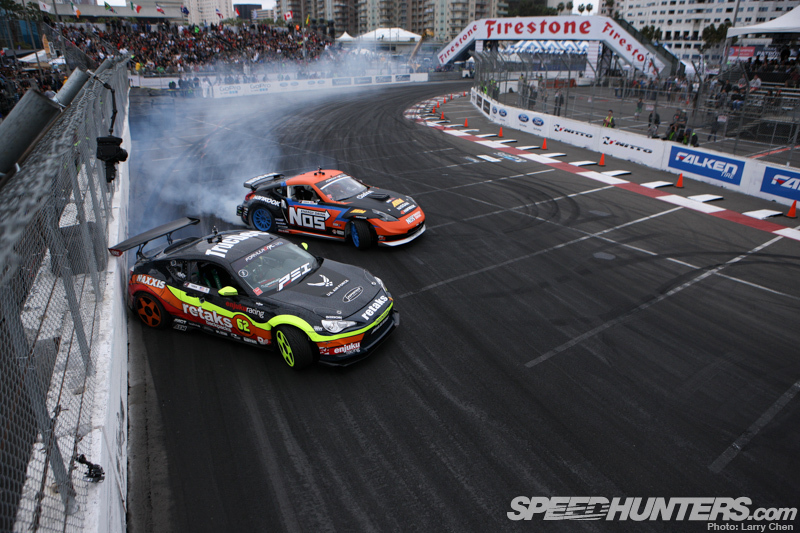 Daijiro is not simply just drifting his car, he has literally gone into ‘overdrift‘. Dai and the SPD Metal Works team along with the help of chassis engineer, Mike Kojima, have figured out a way to achieve more grip and pull more lateral Gs than was thought possible. 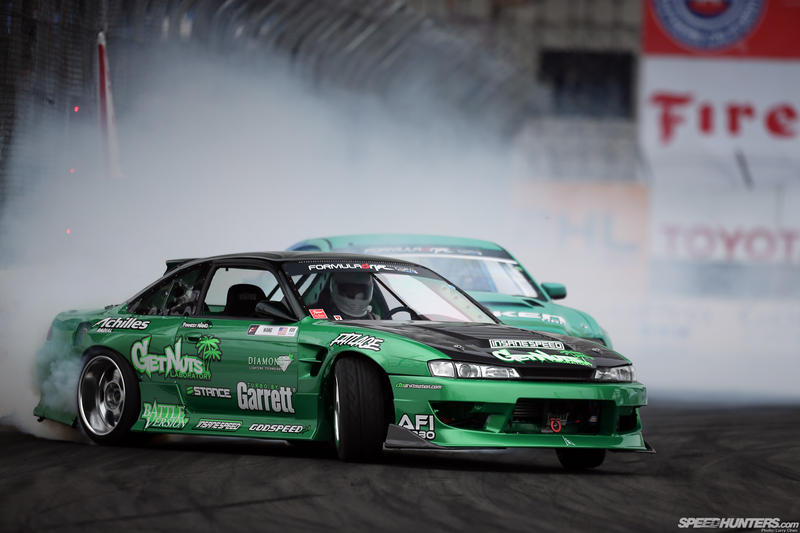 Now more than ever, Dai’s S13 is the most advanced and well engineered S-chassis in the world, period. As my life was shortened just a bit from breathing in Dai’s burnout fumes, I thought to myself how the heck did we get here? It was not like this eight years ago. Back then it was ok to loose drift and re-initiate mid-run. 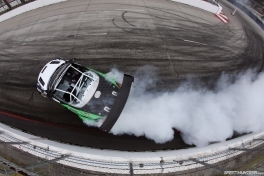 As mentioned in my interview with Formula Drift co-founders, Jim Liaw and Ryan Sage, the ship that is Formula Drift can only be steered a small amount to where the two founders want it to go, because the sport as we know it has taken a life of its own. I hear about how the sport has grown exponentially and yes that is very true, but the grid has remained largely the same. What has grown is the level of competition and precision that the teams operate in. 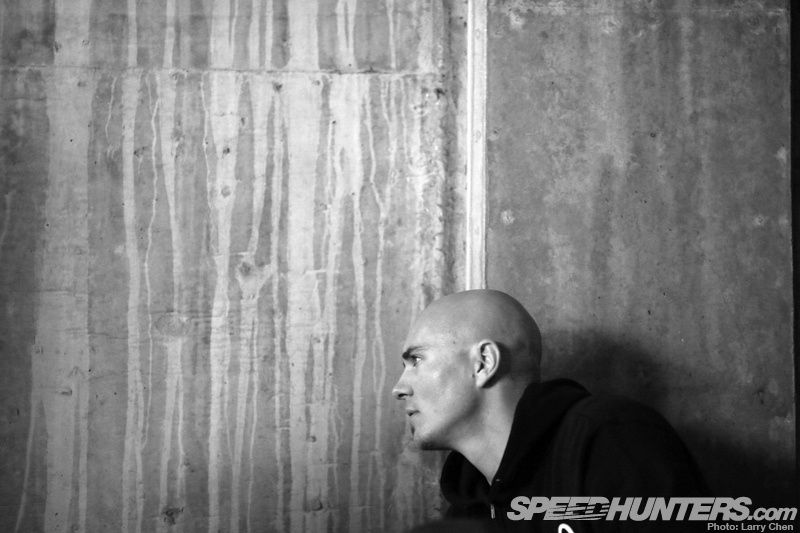 Jim and Ryan mentioned that in the beginning of the series they had to keep the JDM influence, and it was evident with the infusion of JDM drivers, judges and of course the cars. But before long, the domestic manufacturers started to take notice. How could you not? 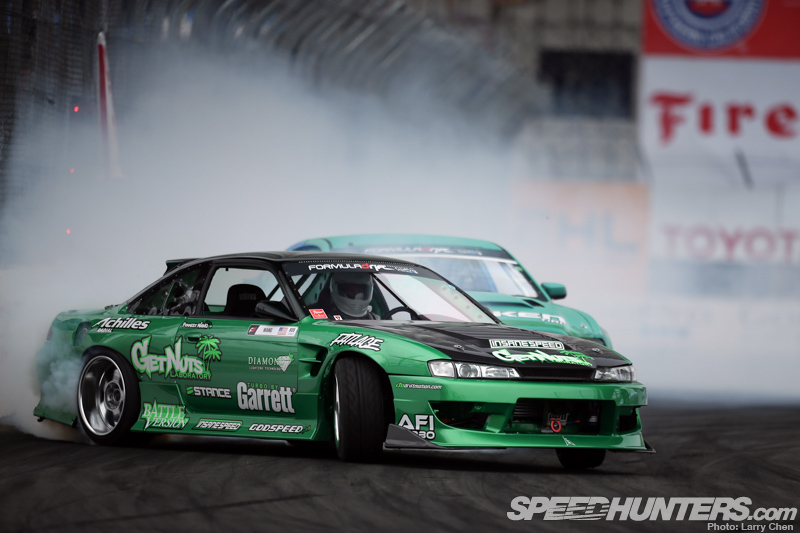 Pretty soon there was the V8 invasion, and staying true to drifting’s JDM roots went right out of the door. I for one have no problem with it whatsoever. I just love seeing the massive American cars getting their slide on. It has become cool beyond belief. 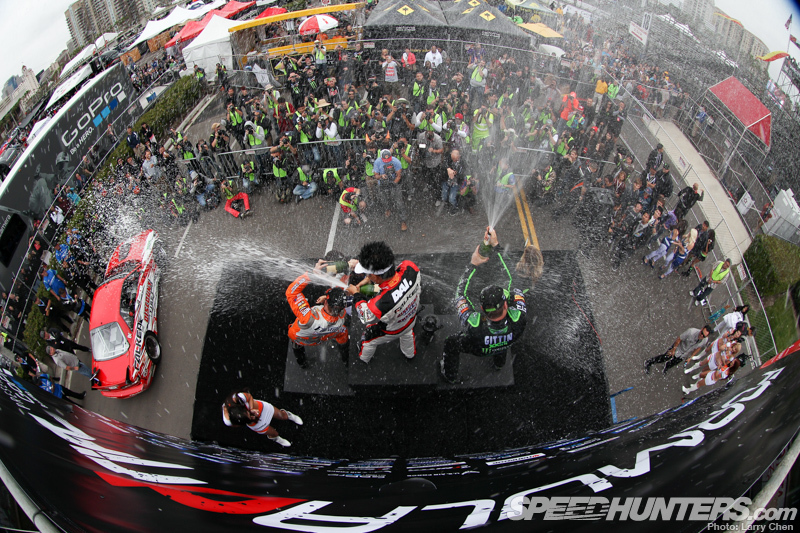 There was no way I could have predicted this back in 2006 at the inaugural Formula Drift Long Beach. It’s really big now. It’s international in fact. It’s not a novelty anymore and there is really big money in it. The naysayers will mention that it’s much harder for the privateers to compete with the big dogs now, but I totally disagree. If Formula Drift had its very first event just ten years earlier, say around 1994, then I don’t think it would have done well. Because of the digital age the people in the series are minor internet celebrites. 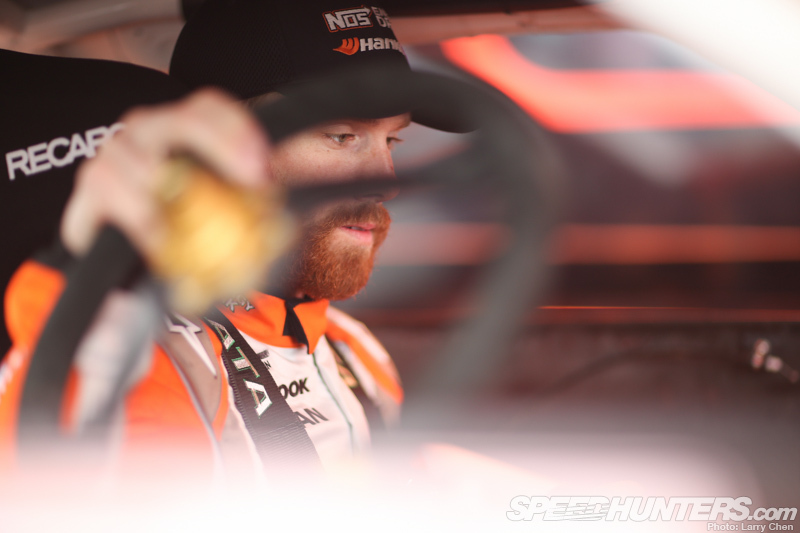 Each and every driver in the series no matter how rich or poor can market themselves solely from their cell phone, even from the seat of a drivers’ meeting. 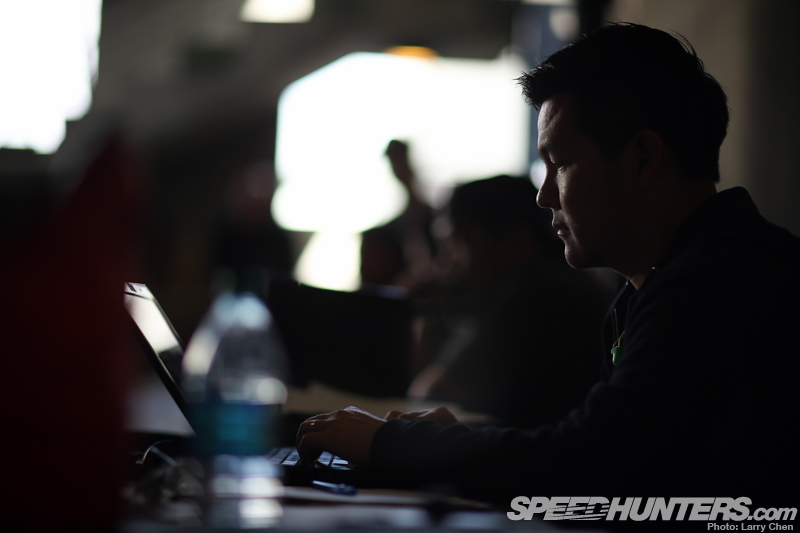 It really helps that Speedhunters supports and backs Formula Drift 100% since its inception. Just look at how happy our fearless leader, Rod Chong, was after the event. It’s almost like he was human for a split second. The classic example of the evening of the playing field is Danny George, the peoples champ. I did touch on this in my qualifying post, but I wanted to dive a little deeper in this feel good story of the year. This funny looking guy loves drifting. 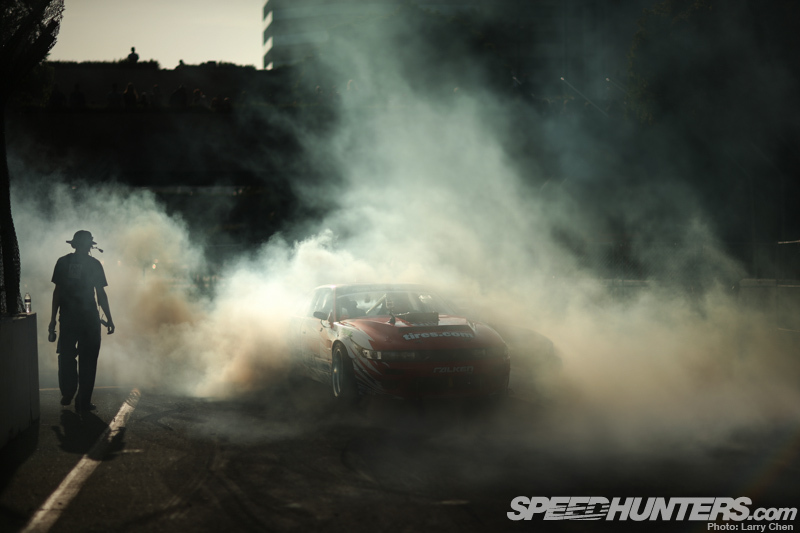 Probably even more than me, since I can’t really drift (I love circle burners). He was not able to secure enough funds to compete for the whole season this year, so with just a few days before the registration deadline he decided to start a campaign. He would sell Danny George T-shirts and he would also sell squares on his car for you to put your face on. He was doubting himself that he was not going to make it. He thought there’s no way in hell he was going to sell $25,000 worth of T-shirts and picture space on his tiny Miata. He was right, he didn’t hit $25,000. 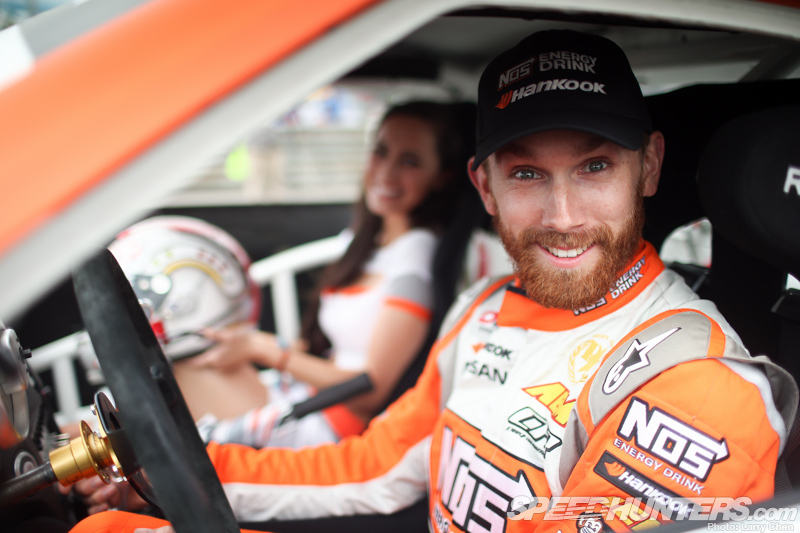 He hit $16,000, but with the help of Hankook and various sponsors, he made it. Amazing, just amazing. The 2013 season will be the year of the rivalries. Chelsea DeNofa had a stone in his shoe (buttocks) all of last year and it was Daigo Saito. Him and everyone else on the rookie grid was very bitter about Daigo Saito winning Rookie of the Year in 2012. Now Daigo has a huge target painted on his back. The Bridges Racing team has been very busy during the off season to improve on the ninja’s ride. 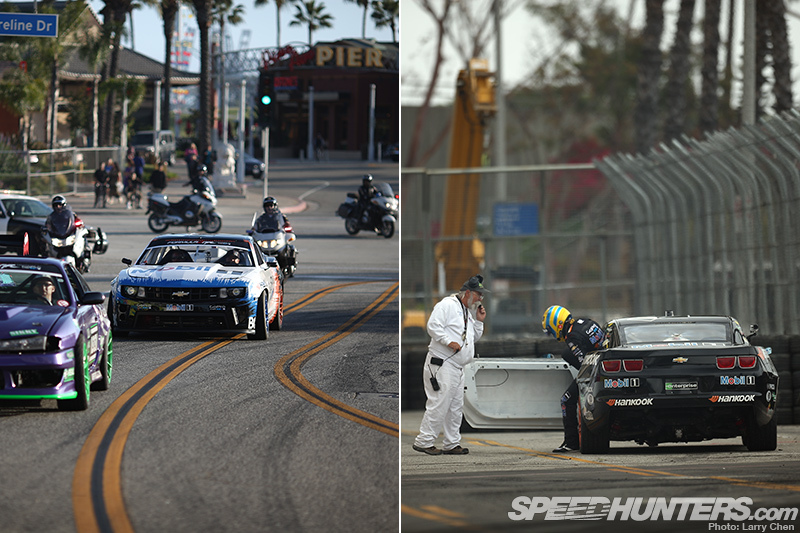 However it seems that they ran into some issues right before Round 1 at Long Beach. 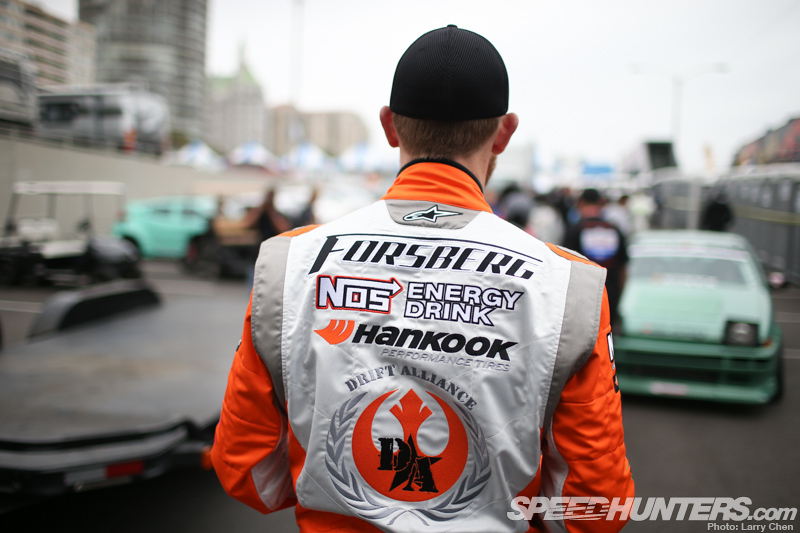 Enter Fredric Aasbo, he literally is Daigo Saito’s Norwegian kryptonite. 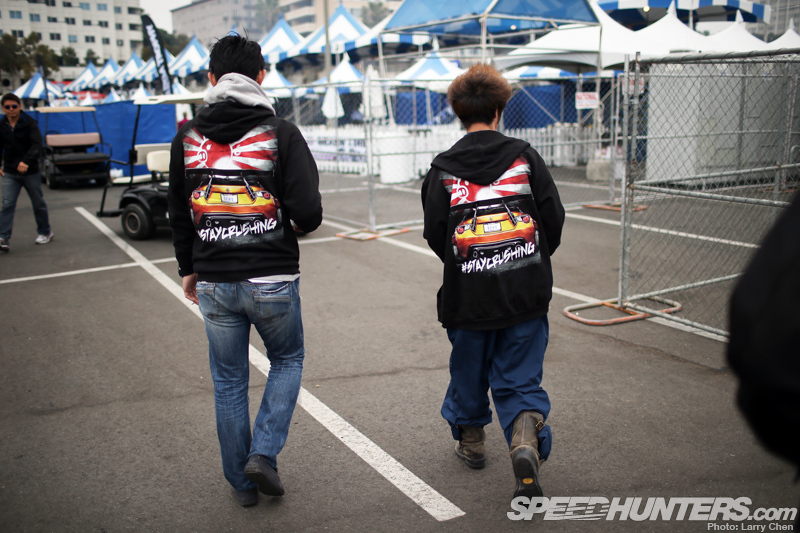 What does Daigo think about when he is following this re-purposed grocery getter? My wife drives a Scion tC and it certainly isn’t good for drift racing! I am curious to see where this rivalry will go. 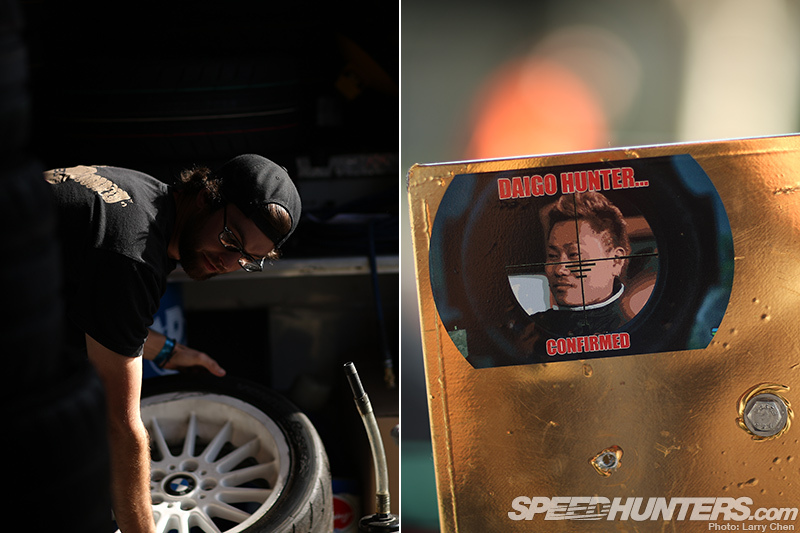 Like Fredric Aasbo, Matt Field has a bone to pick with Daigo. 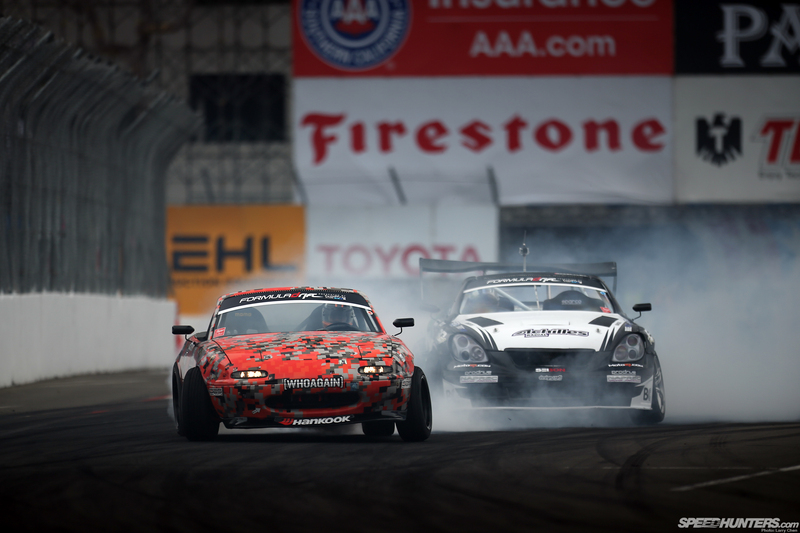 After last year’s battle with Daigo at Irwindale, I sat down with him for some one on one drift talk. 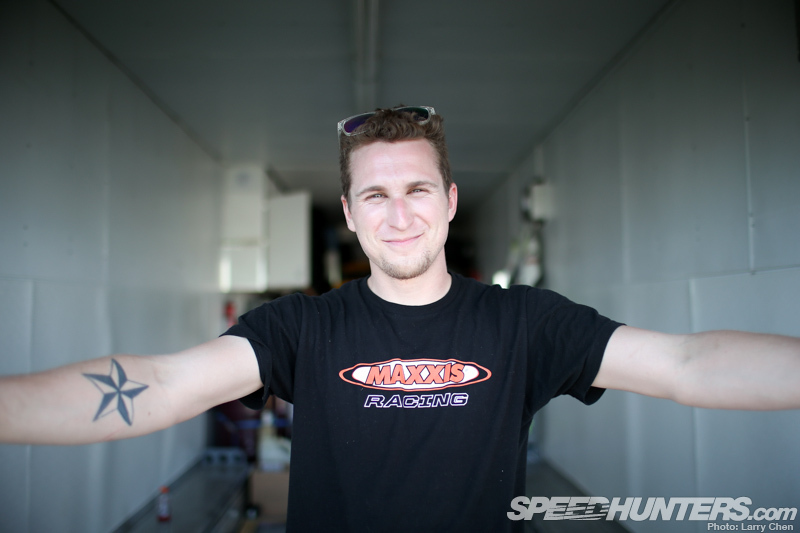 Matt’s back, and ready to throw down with an all-new power plant, and a couple more sponsors under his wing. 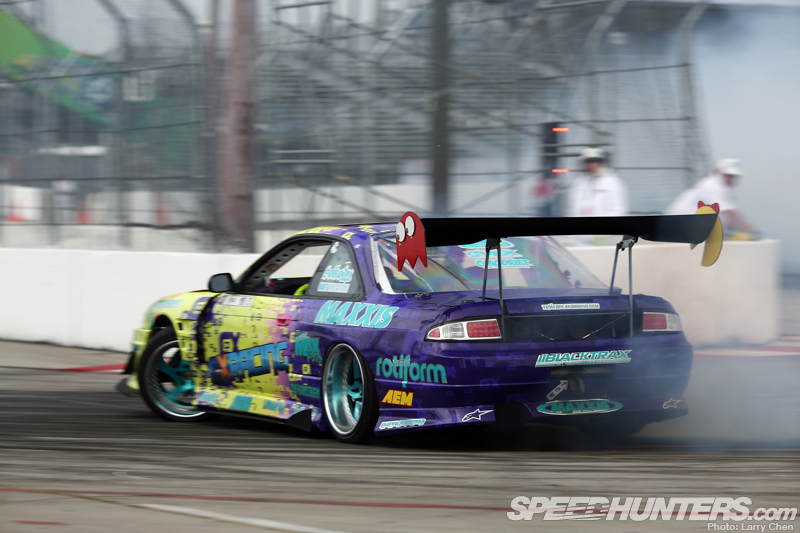 It was very evident that the 80s theme was in full effect on his blast from the past drift car. Matt is so helpful around the paddock, he even helped the judges setup the course to his own liking. With a new season comes new cars, and one of the most notable cars is Ryan Tuerck’s 2JZ-powered Scion FRS built by Portland Speed Industries. 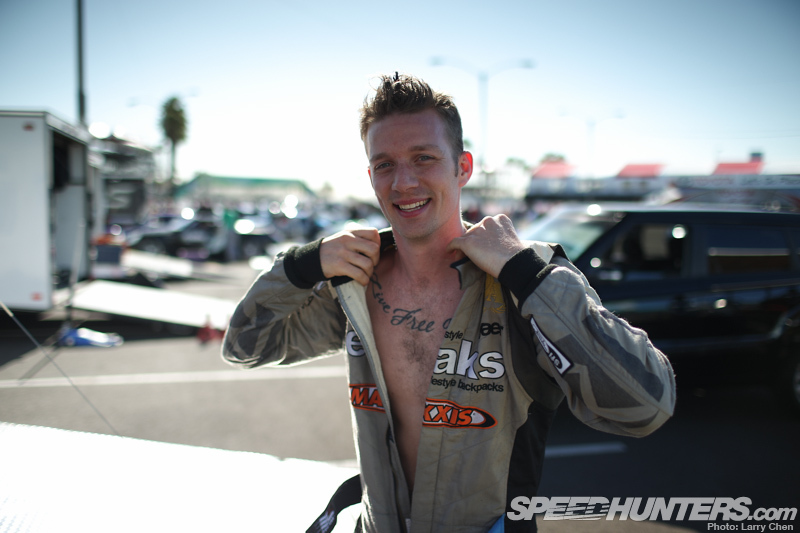 If you read Speedhunters, you know that Ryan’s shirt is rarely on. Well, if I had a body like that I would just run around naked all the time. Ryan hates wearing shirts, and he hates his cars to wear body parts, so he made sure to quickly take them off. It’s almost as if the guys at Portland Speed Industries put into consideration how much of the wing should hang over the rear bumper. 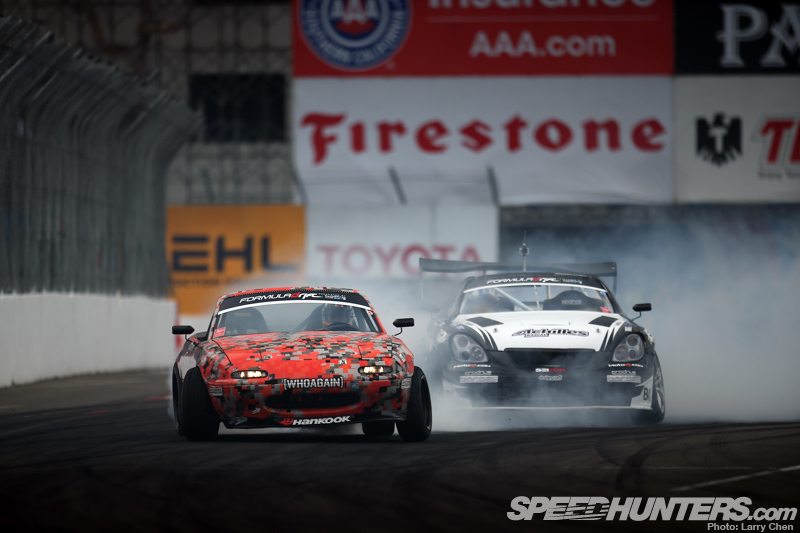 Is Ryan the honey badger of drifting? Considering the honey badger doesn’t wear any clothes, I say yes! 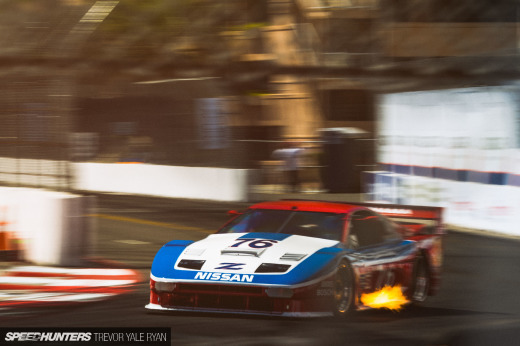 Many fans of drift are getting a little fed up of the Toyota ZN6 invasion. Not me, however. The ZN6 has taken its place as the new S-chassis. I think it’s really cool seeing all of the different motor and drivetrain set-ups that are appearing as this chassis gets more refined. To think this car has only been out for a few years is crazy. 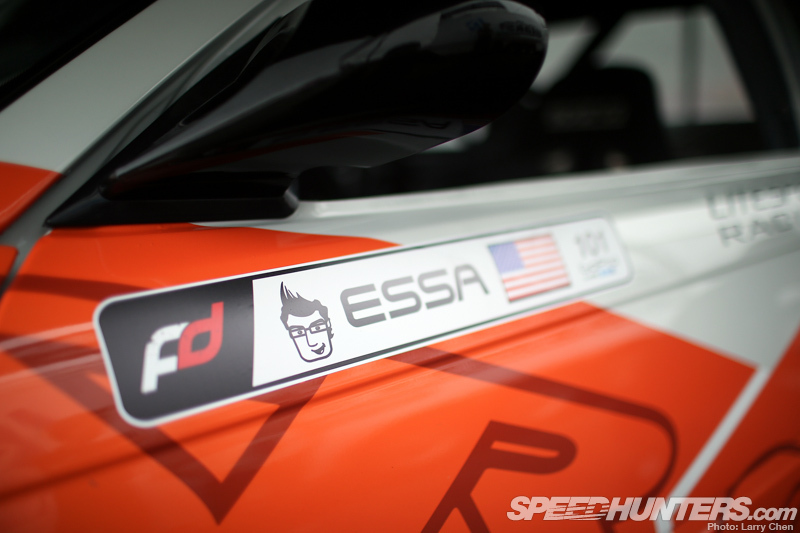 I think one of the coolest new cars out on the grid belongs to Mike Essa of GSR Autosport. He built the entire car himself and boy does it scream. I always mention that Mike has the best caricature on the FD grid, but I want someone to come and challenge him this year. Any takers? Also with a new car is the all-American drifter, Conrad-ical Grunewald. He is touting the lightest fifth gen Camaro build by BRE motorsports; in the sub 2700 pounds range. Over the entire weekend he was running into major issues with the electrical system as well as the tune. He was also suffering from clutch issues as it would not disengage. When it came time for qualifying his starter motor was not functioning so he let his car idle as he was waiting to go on his first run. That resulted in him running out of fuel on the grid, which forced him to forfeit his first run. With luck definitely not on his side, his clutch then wouldn’t disengage on his second run forcing him to straighten out on the last corner. Conrad was not the only Chevy on the grid that was having issues though. His technical partner, Tyler Mcquarrie, was also having major issues. He qualified 32nd which pitted him against Daijiro. I was expecting to see a great battle that was fit for the finals, but his rear end gave out right before the top 32. Hopefully he will have everything sorted out for round two in Atlanta. 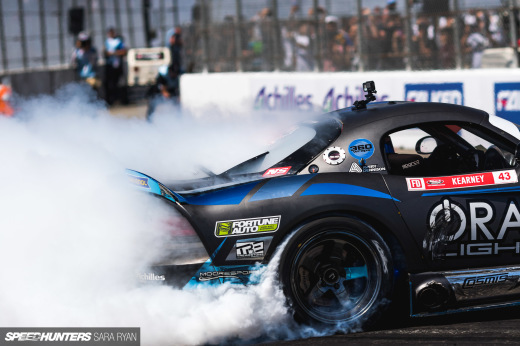 North American professional drifting would not be the same without the heavy hitters of Formula Drift, and Chris Forsberg is about as heavy as it gets. 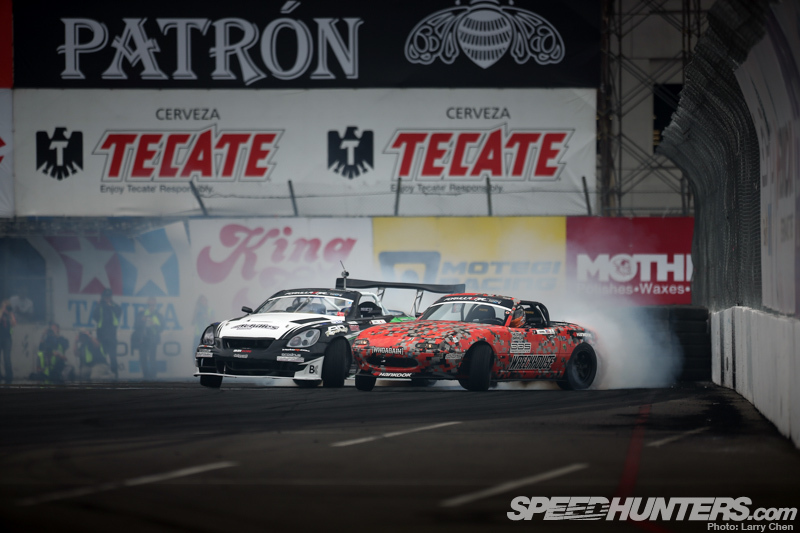 The former champion is constantly improving on his Nissan-powered 370z platform, but it is very hard for the team as they are at the forefront of development for this car. No one else has re-purposed a Vk56 race motor for drifting. As always Chris was in high spirits during the entire event, but major electrical issues were looming in the back of his mind. For some reason the ECU was freaking out under heavy load right after initiation going into turn nine and the motor would break up, but then it would clear out by the time he got to turn ten. The mad scientists at MA-motorsports figured out it was because the crank sensor was loosing sync with the trigger wheel. Due to the motor heating up and the oil getting thinner, it was coming off by a thousandth of an inch, but that was enough for the ECU to not like it. For Atlanta they’re switching to Motec as they can compensate for whatever conditions they’re running in. The team also had a new spotter which was very helpful, as he suggested last minute changes in between tandems right up to the final battles including gear ratio changes depending on who they were running against. Yes, it is that serious now. Chris battled his way up through the ranks with the motor cutting out intermittently. Chris told me that he’s not giving any excuse as to why he lost to Vaughn, but he told me that his car bogged the worst out of the entire weekend going against his Drift Alliance teammate. 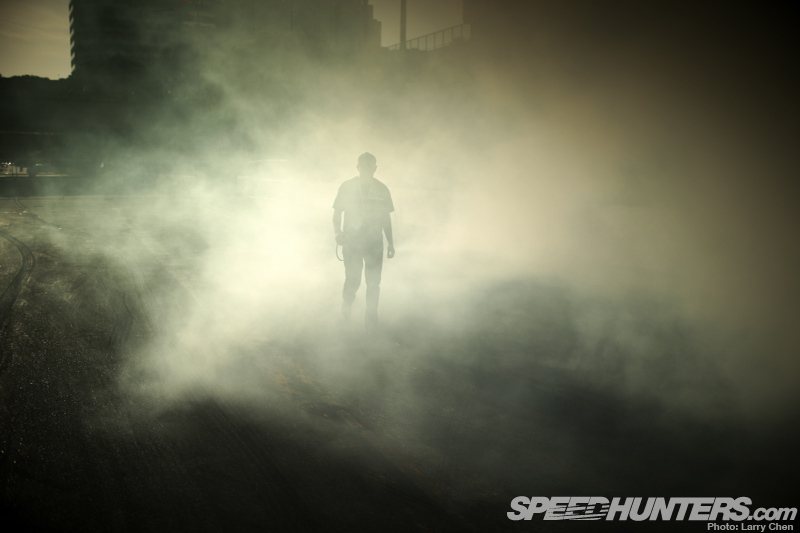 The lead run was great, but when he flicked it in to keep up with Vaughn the car just had no power and it was very evident with the amount of smoke he was producing behind Vaughn. The team was able to button it up enough to run against Chelsea Denofa for third place though. I’m curious to see how Chris will do with a new ECU in Atlanta. 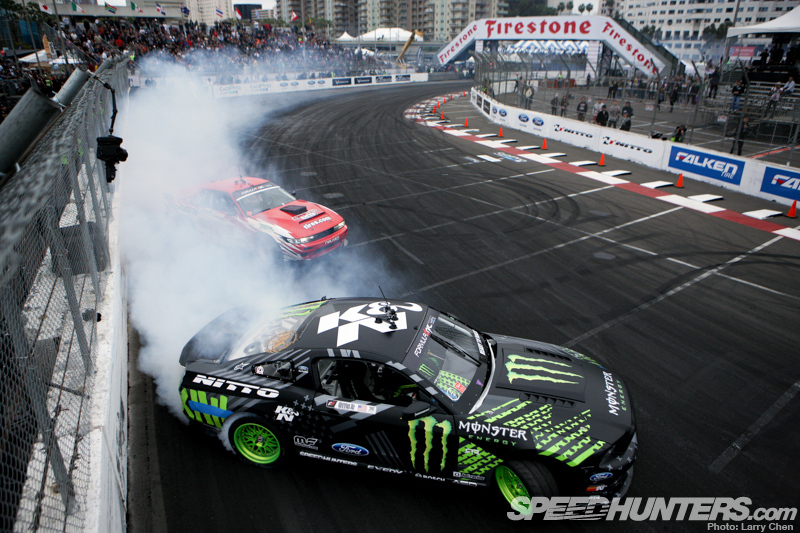 The Monster drifter himself put everything on the line this year, as he has become a team owner for the first time. 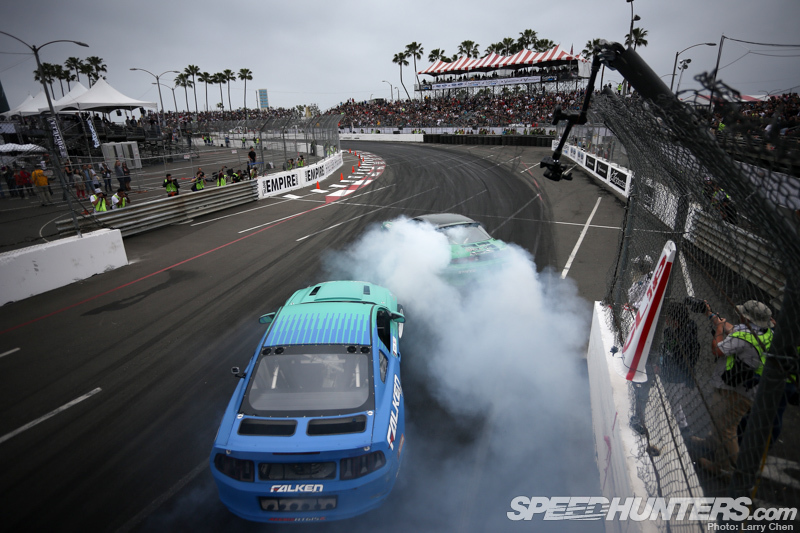 I think this is a step in the right direction and it’s also a big step for Vaughn’s drifting empire. Who knows what it will be like later down the line; maybe he will have an entire team of drifters under his belt when he retires. Either way, he was totally on point the entire weekend. As I mentioned in my qualifying article, he’s had terrible luck in the past two years at Long Beach. However this year it seems that he had something to prove as a team owner/driver. 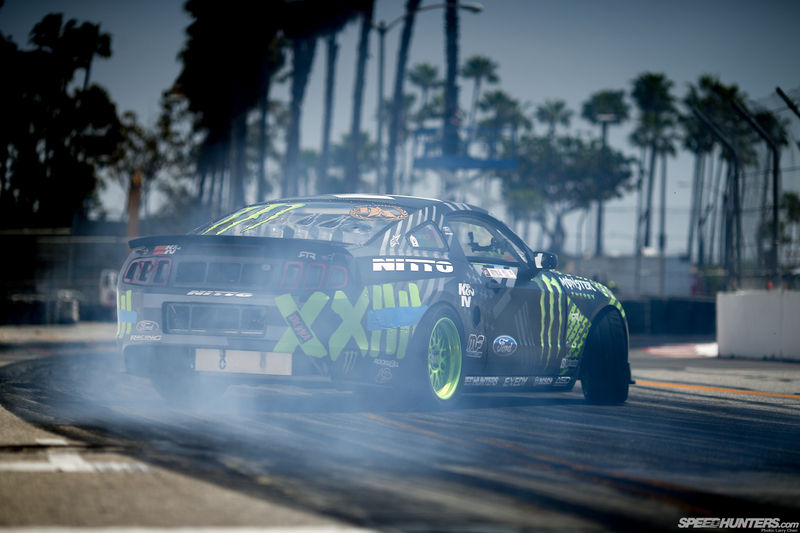 The monster drifter that we see every now and then came out and dominated the field. We all know Vaughn picks up steam later on in the season, but will this be enough of a head start to fend off Daijiro and Daigo for his second championship? We’ll just have to wait and see. 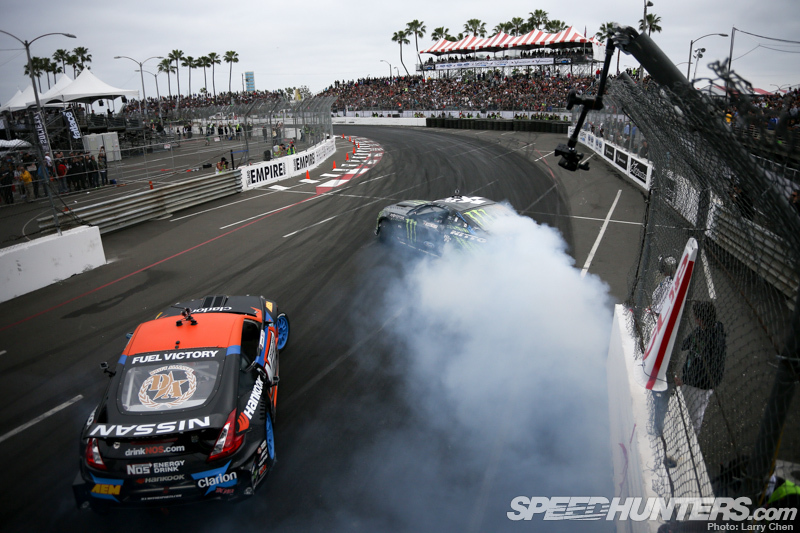 The other staple drivers to watch out for include Ken Gushi, who has been to every single Formula Drift event from the beginning. We highlighted his Scion FR-S recently during testing, and he seemed to like it. He had an incredibly strong showing this round finishing in seventh place. 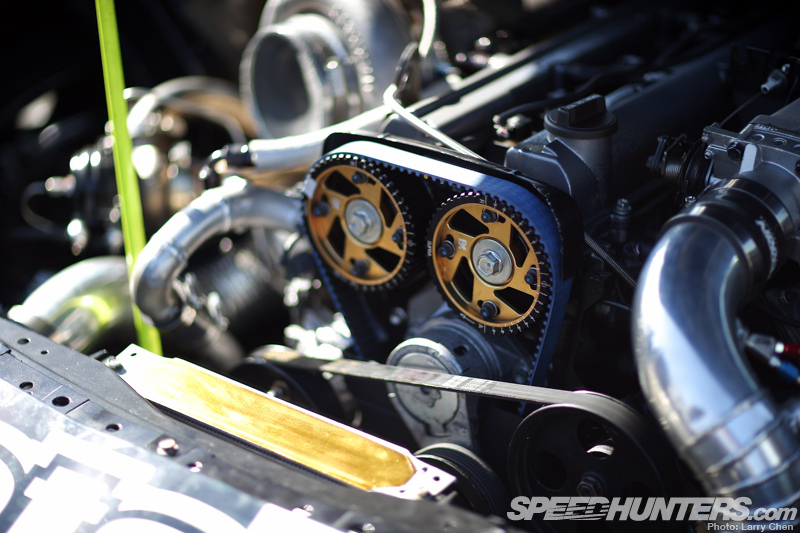 It’s very evident that with the likes of Ken and Fredric Aasbo, the turbo cars are making a comeback. 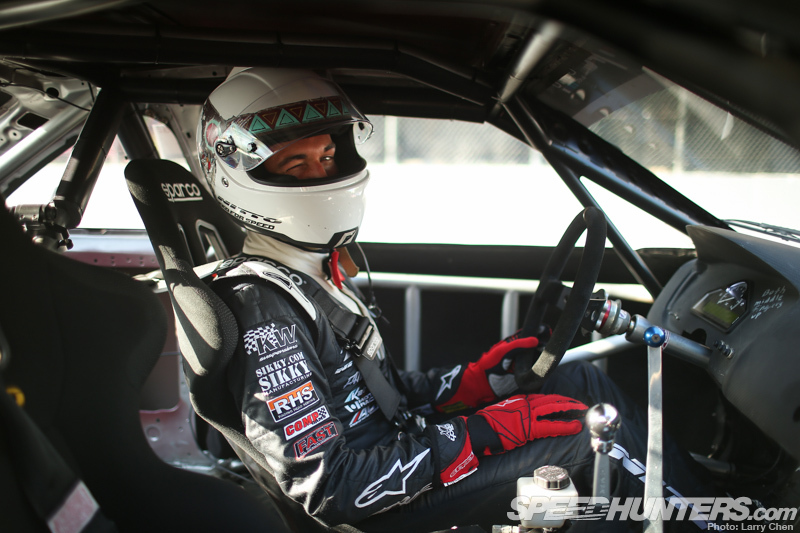 Back in 2007 Kyle Mohan ran his very first Formula Drift event, and placed fourth. 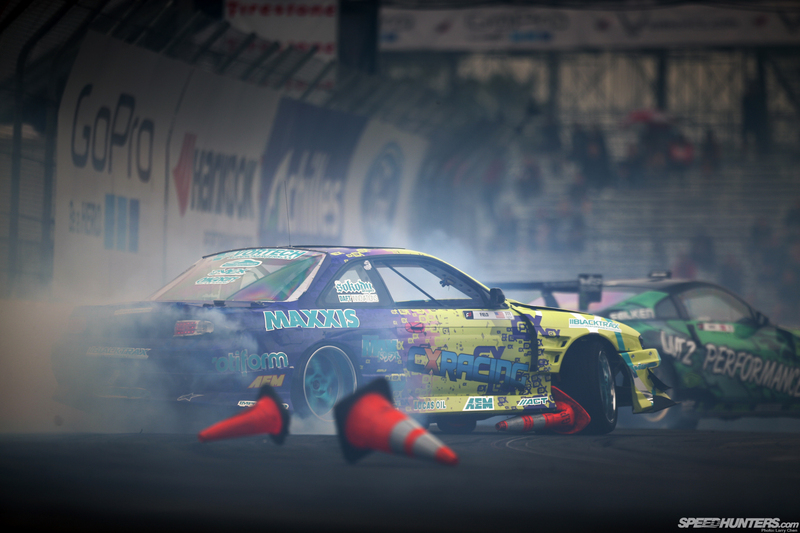 What a way to start off your professional drifting career! Since then he has stuck to his rotary roots and constantly improves on the RX-8 platform. 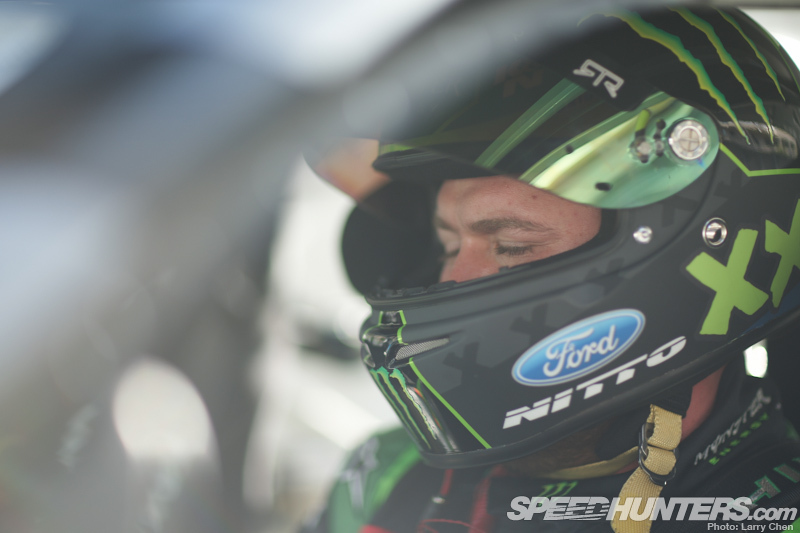 Kyle is a qualifying monster, as he’s always near the top. This year he’s running more horsepower than he’s ever had and on top of that he’s using nitrous. 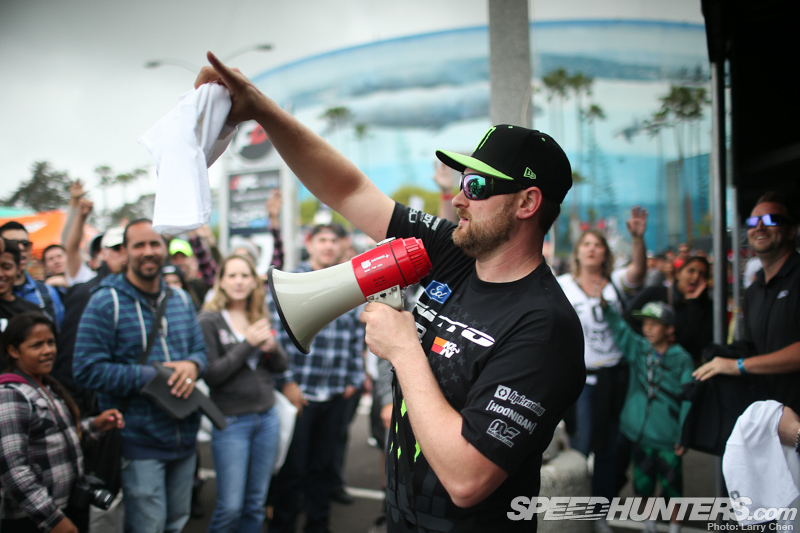 Everyone’s favorite heart breaker has also become an essential part of the Formula Drift series. 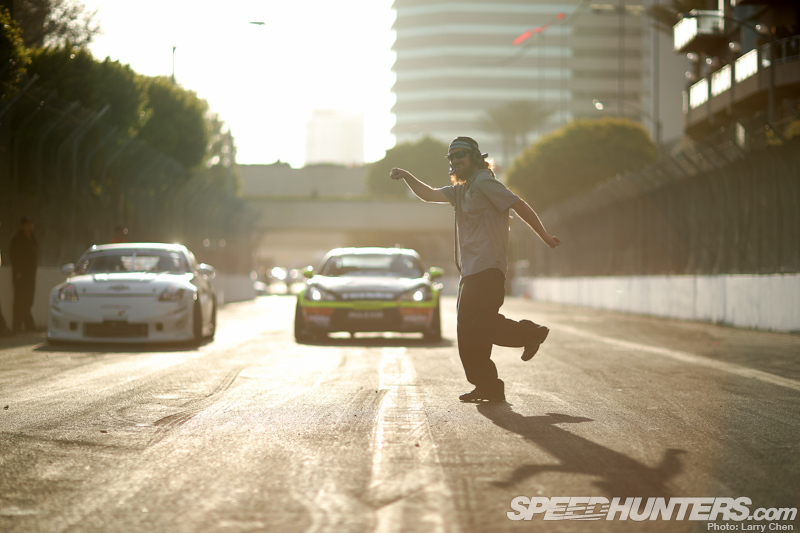 He single-handedly brings hordes of young women fans into the sport of drifting. 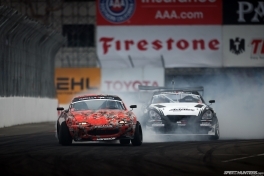 For the past two years Matt has finished very strong at Long Beach, but the luck of the draw pitted him against event winner Daijiro Yoshihara. He got knocked out in top 16 and finished in 14th place. Who knows what other crazy bow ties Matt will wear throughout the rest of the season. Before I let you guys finish your business (you’re reading this on the throne right? ), I wanted to touch a bit more on the rookies and privateers. Dave Briggs campaigned a mean-looking LS-powered 350z last year, however it seemed to have been cursed and Dave appears to be destined to drive cars with no more than four cylinders. So this year he’s back in an SR-powered S-chassis. Ryan ‘the kid’ Kado is not a kid any more as he has a child of his own now. 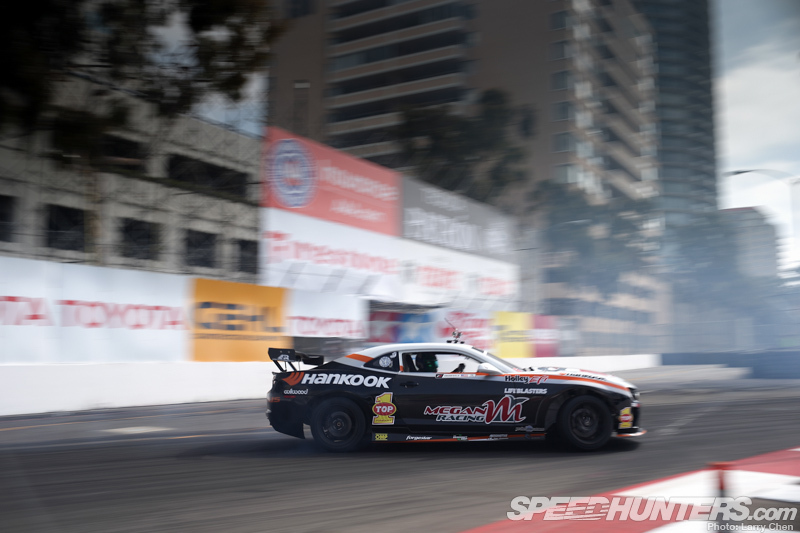 I consider Ryan one of the most skilled drivers ever to come up from the Thunderdrift Pro-Am series. 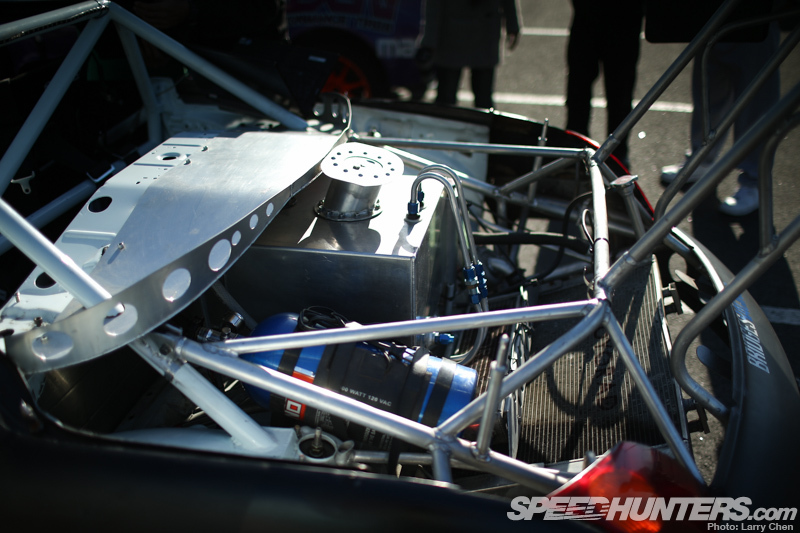 His turbo 350z was running sans turbo during qualifying, but he still qualified 13th. Many of the privateers run under the radar, and Miro Ovcharik is no exception. His car has little to no sponsor decals, as it looks like a street car. Which reminds me of someone else I know. On the complete opposite end of the spectrum is Nate Hamilton. 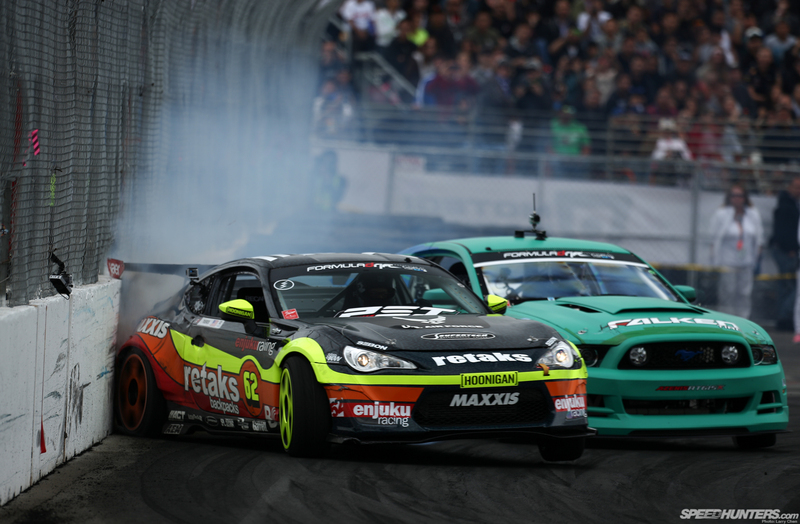 With the amount of buzz around this rookie, you’d think he’s been driving in Formula Drift for years! He still has many bugs to work out with his car however, as he did not qualify in the top 32 at Long Beach. Another privateer with a brand new car this year is Dennis Mertzanis. 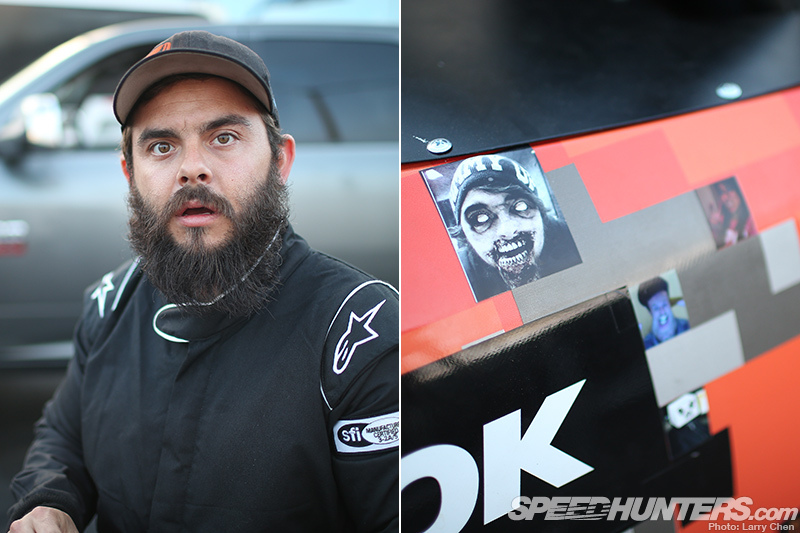 He actually works for Hyundai Motors of America so it was very fitting for him to run this season in a Genesis coupe. Pat Goodin used to fly under the radar, but his skill and sense of style is something that is hard to ignore. 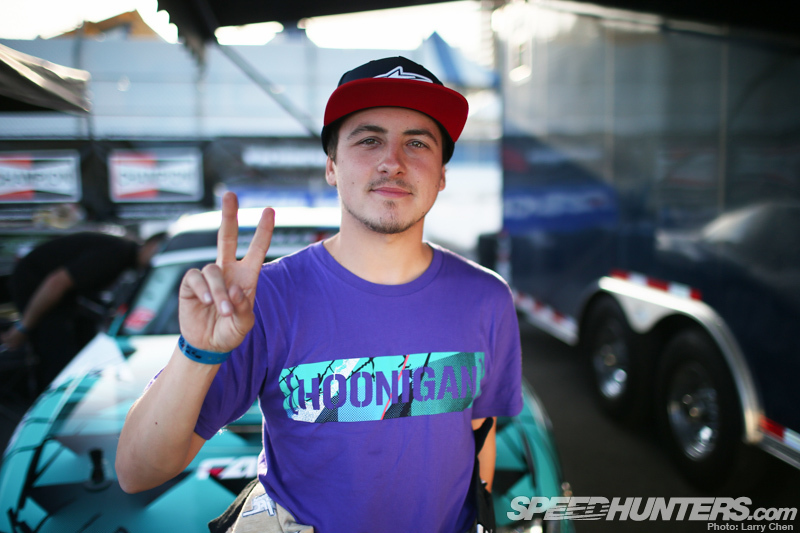 It’s too bad that he was paired up against Vaughn Gittin in the top 32. 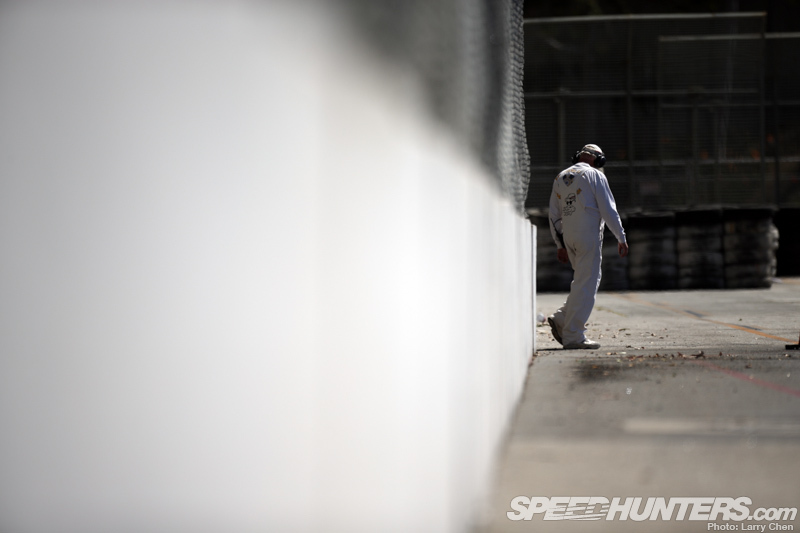 Many drivers returned to the series after a long hiatus, and it takes a while to get back in the groove of things. I’ve been following Forest Wang ever since I started shooting motorsport. His driving skill and fabrication is unparalleled. 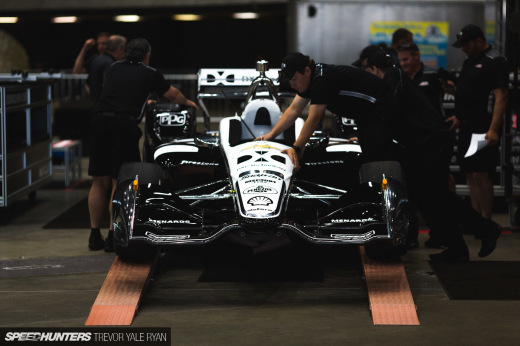 Keep an eye out for a feature on this wonderful machine, which I think is the best looking car on the grid this year. 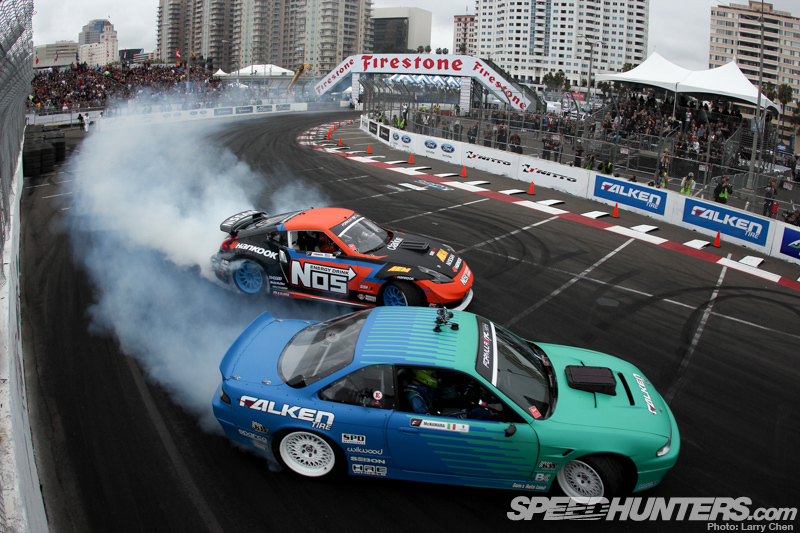 It really got me excited to see Forest battle his long time rival Justin Pawlak. As I mentioned before, these guys threw down all the way back when they were still trying to earn their Formula Drift license. Justin knew what Forest was capable of, so he really let it all hang out. There is no doubt in my mind that Forest will podium at least once this year. Rookie of the Year is such a coveted title, as most of these guys end up getting picked up by a major sponsor. I think one of the guys to keep an eye on this year is Brandon Wicknick. 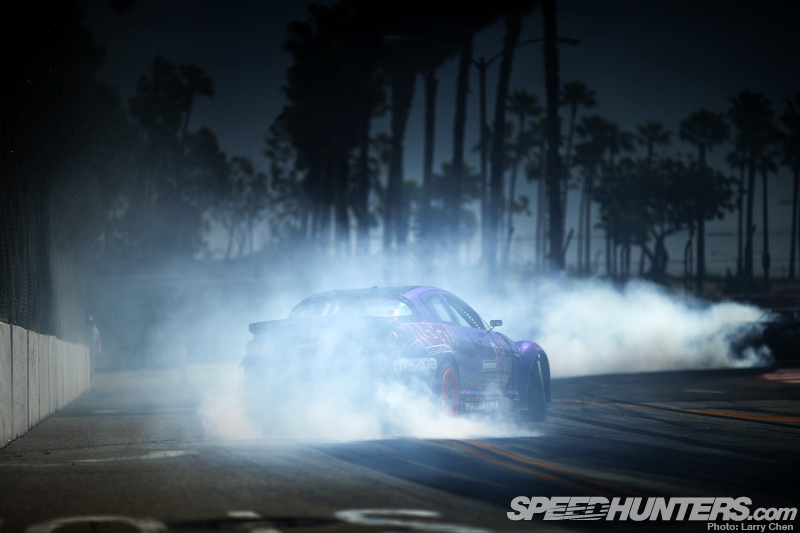 He was making Daigo Saito-level smoke, just in practice. 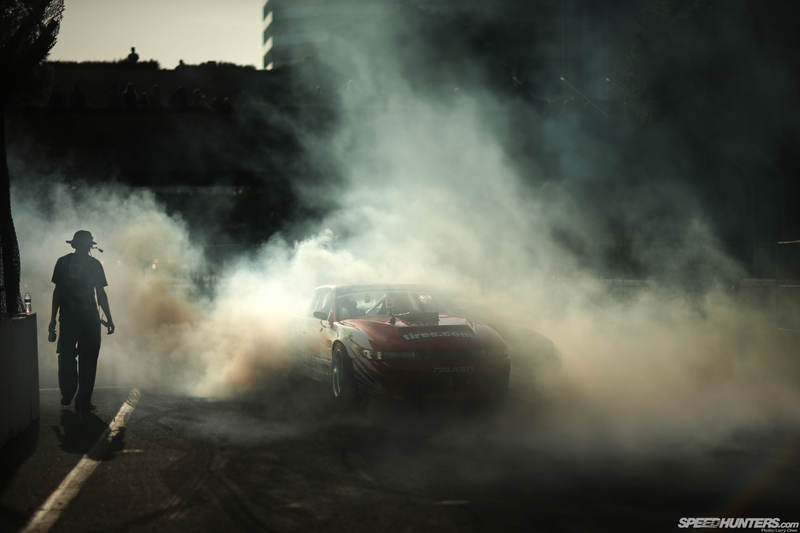 So enough about drifting. 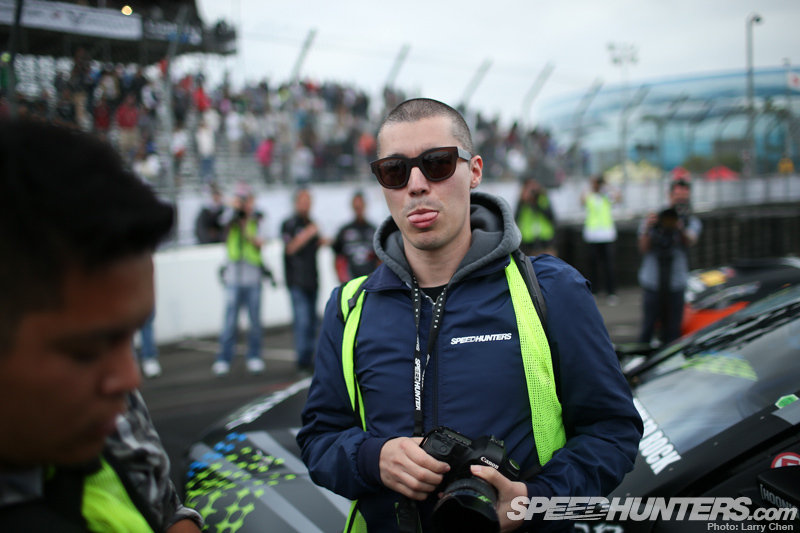 I know the real reason why you Speedhunters out there attend these kind of events. 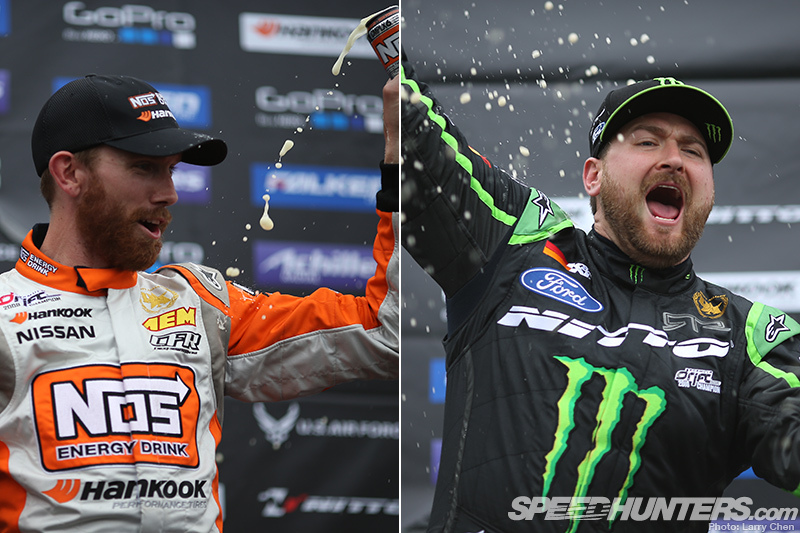 Not only have the cars evolved at Formula Drift, but the spokesmodels have evolved as well. 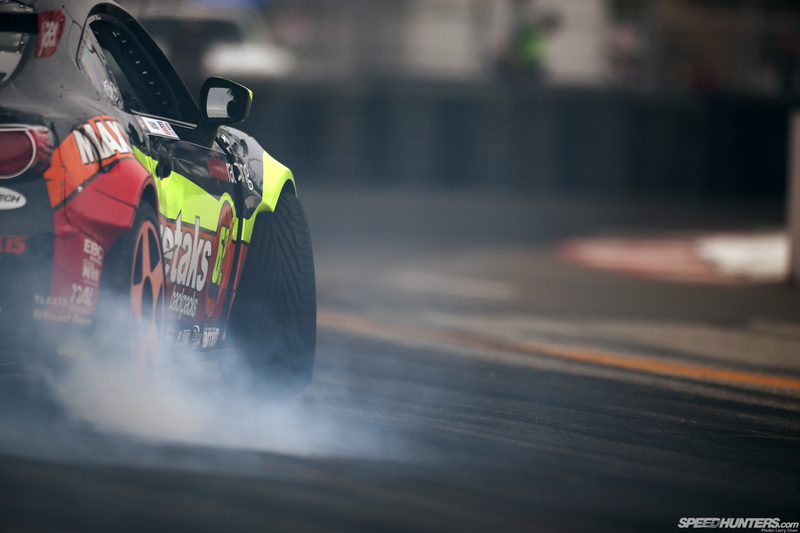 Am I the only one who thinks Formula Drift should have a beauty pageant? I don’t envy their job though, It’s gotta be hard to stand around in the sun wearing heels all day. In fact I think it would be great to see some role reversal this year. Maybe we can have the models drive some of the cars while the drivers stand around half naked all day. 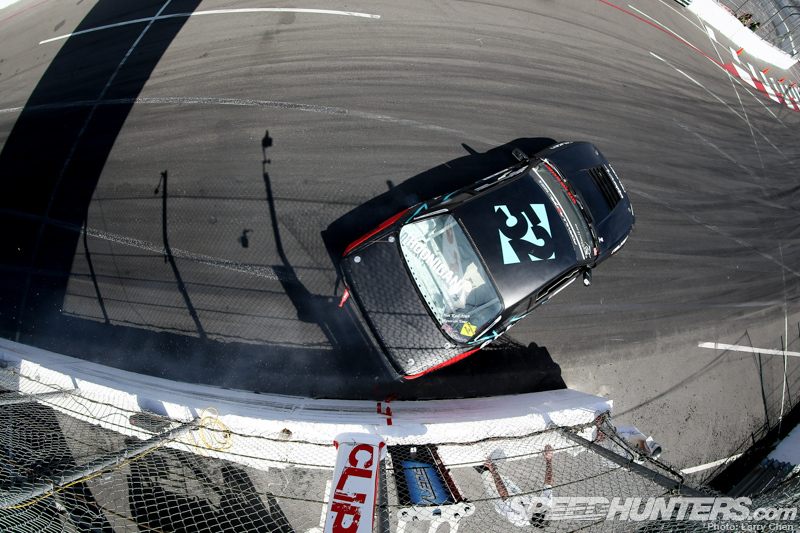 Ryan Tuerck is practically doing that already anyways. 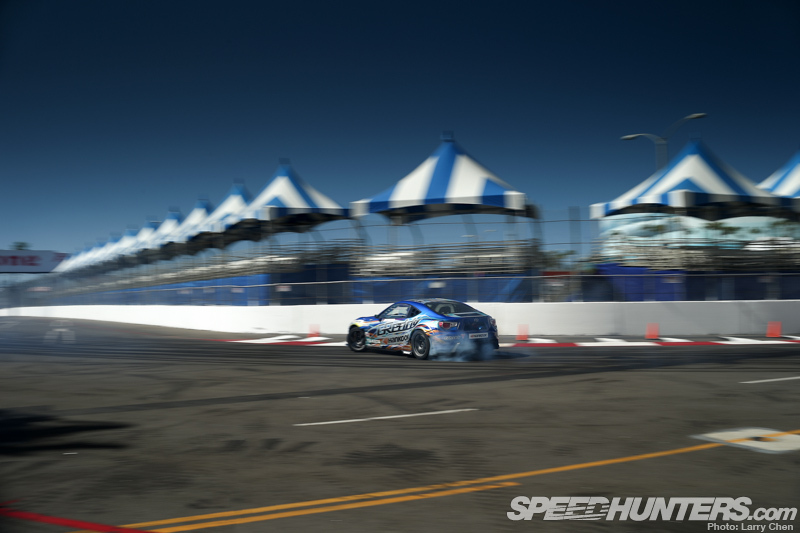 All kidding aside, Long Beach is THE most brutal course out of all the seven rounds of Formula Drift due to the unforgiving nature of the concrete walls. Daijiro Yoshihara almost lost his perfect victory during practice as he tapped the outside of the wall going into turn ten. Thank goodness he saved it. 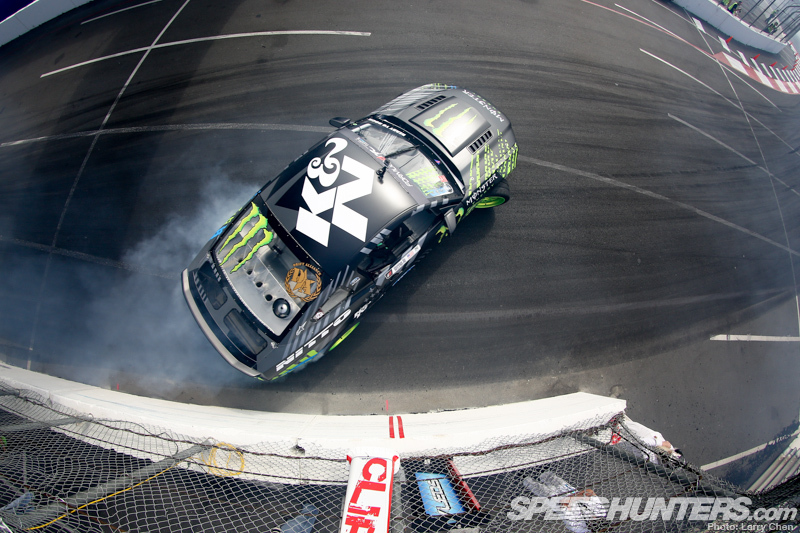 The last driver to have a perfect event (112 points) was Vaughn Gittin Jr. back in Seattle last year. 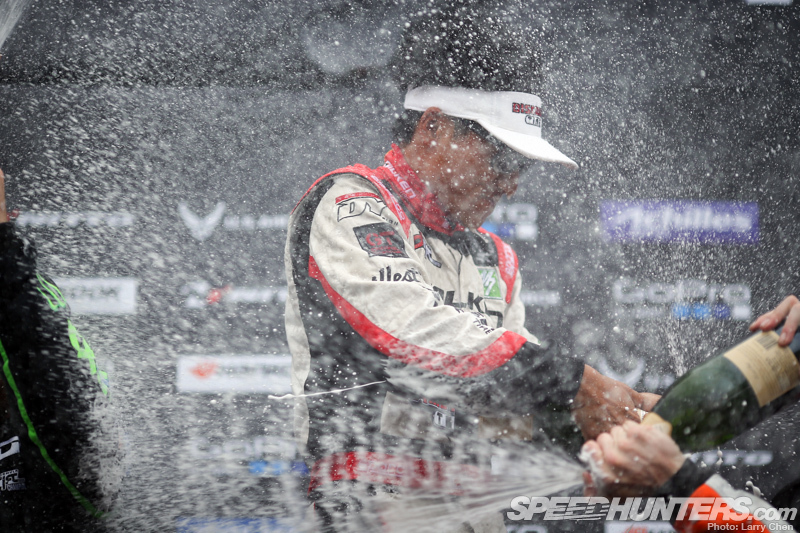 As the boys at Life Blasters mentioned, at this point Dai is the only one in Formula Drift history to potentially have a perfect season (784 points). … and Daijiro Yoshihara is the 2011 champion, which makes for an interesting first, second and third lineup. 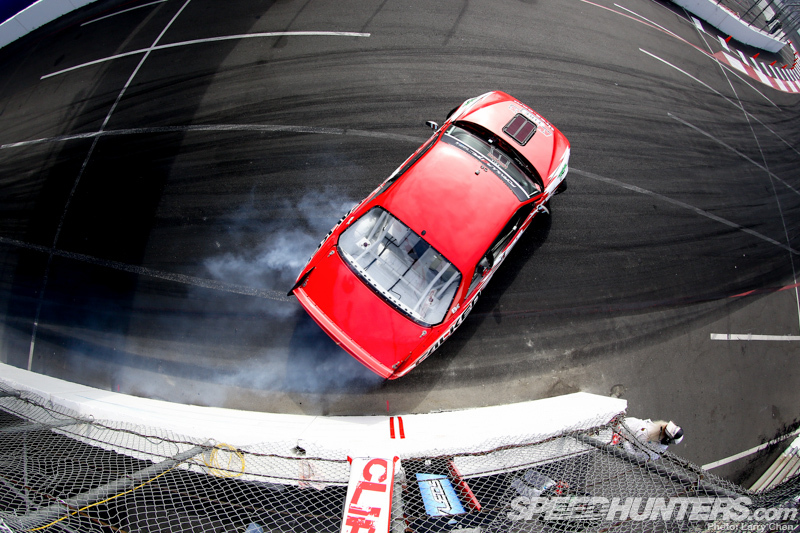 I guess if there was a zero place it would go to Daigo Saito. Now more than ever the pressure is on for the judges to make the most accurate calls, and the series’ producers have implemented many new systems to aid them this year. There’s also some change in venues. The Las Vegas round was taken off the schedule, but the series will be making a stop in the heart of America at Texas Motor Speedway. I can’t wait to see how that will pan out. 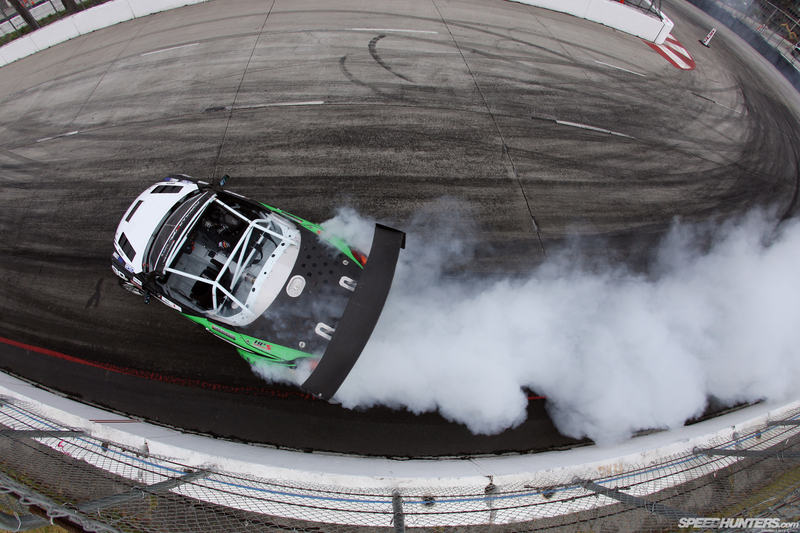 Here’s to a great season of drifting and to ten more years of sideways action.